I’m not one to throw supposed benefits around brazenly when it comes to herbal products, and especially, perhaps, with essential oils. I am the eternal skeptic, but one who is willing to do what it takes to examine both sides of an issue with the vigor required to get a balanced answer that I am satisfied with. Rarer has this been true than with the story of Chamomile. It is one of the best-known herbs, and after finding out how intoxicating the scent of fresh Chamomile was when growing it in my own garden, I had to dig my heels in and do some research. What this study discovered, was that a component that exists in more than one essential oil, known as a “terpenes” (especially monoterpenes and sesquiterpenes) have measurable effects on the Central Nervous System. Two of these measurable effects are anti-anxiety (anxiolytic) and pain blocking (antinociceptive). Since many of the Top Essential Oils we offer are in the category of anti-anxiety / stress reduction / relaxing / calming, and support for pain, this was especially intriguing to me. Without getting too technical; Bisabolol is an unsaturated monocyclic sequiterpene alcohol, which is the major constituent in German Chamomile. (That is exactly why we offer only German Chamomile, with confirmed high concentrations of bisabolol in every freshly-distilled batch.) The study found that the pain-relieving properties of bisabolol to be so effective, that the researchers concluded that any essential oils rich in bisabolol could potentially be good candidates for assistance with pain reduction. 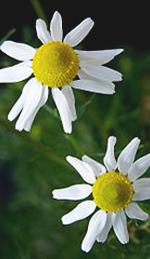 What this means is that they found German Chamomile to be an effective natural means of both reducing pain and anxiety. Not a bad one-two punch for an esteemed and ancient herb. The good news for Chamomile enthusiasts is that the constituents responsible for the main effects in Chamomile are soluble in hot water. They are also present in high quality essential oils, as the ones offered by us here at EOX. I was unable to find any human studies on the anti-inflammatory and pain relieving actions of Chamomile, but there was a plethora of data with tests conducted on rats. Within those studies, comparisons were made between Chamomile extracts and both benzydamine (a popular anti-inflammatory) and hydrocortisol. Although the Chamomile didn’t have properties equal to hydrocortisone, it did compare, side by side, with benzydamine. This is extraordinary. But, before you decide to throw away all your over the counter medications for an infusion of Chamomile, note that to achieve the same level of effects, the Chamomile was more concentrated than a cup of tea, topical application, or inhalation of Chamomile Essential Oil. It’s exciting to know, though, that this natural herbal product that’s been used for thousands of years to help decrease both pain and anxiety, has been proven to possess those exact characteristics. And, the amount required isn’t that much higher than what one might enjoy before bedtime if they’re trying to get to sleep with reduced pain. For reference, 50g of dried Chamomile flowers were boiled in 1 liter of water. In mice, the result was Chamomile-induced sleep! We have plenty of anecdotal evidence from humans, but it is easy to see the potential that Chamomile can have for us humans. I’ve combined some Chamomile in my diffuser, brewed a strong cup of Chamomile tea, and I can honestly report that I felt a noticeable decrease in pain, and not only was able to fall asleep more easily, but I enjoyed a more restful sleep as well. As anyone who reads my articles knows, I come from the perspective of a scientist and a sceptic. So, I never take anything at face value, and never trust a single result. So, my Chamomile experiments lasted over the course of 2 weeks. I wanted to record various conditions; hard workdays, leisurely weekends, both stressful and non-stressful days, and so on. Out of those 14 days, I was able to conclusively say that I was able to fall asleep easier. Fourteen out of those fourteen days, I could also conclusively say that the pain I usually feel in my calves and joints of my fingers were noticeably reduced. This may have added to my feelings of calmness and my anxiety reduction, and it may have helped me to fall asleep more easily, but the results are the results and I couldn’t be more pleased. And, as always, this is just a single case and a single person’s results. I would be extremely interested to hear anyone share their experiences with Chamomile below. Positive or negative, I’m all ears. I know that all herbs don’t work for all people, but Chamomile (German) is one of those herbs that have withstood the test of of time, and continues to be one of the top selling single ingredient teas of all time. Alves, Aron de Miranda H., Goncalves, Juan Carlos R., Cruz, Jader Santos, Araujo, Demetrius Antonio, M., 2010. Evaluation of the sesquiterpene (−)-α-bisabolol as a novel peripheral nervous blocker. Neuroscience Letters 472(2010):11-15. McKay, Diane L.; Blumberg, Jeffrey B. 2006. A Review of the bioactivity and potential health benefits of chamomile tea (Matricaria recutita L.) and their glucosides. Phytotherapy Research 20(7). This entry was posted in Essential Oils, Science of Plants on August 22, 2015 by Keith Cleversley. Pure birch essential oil is almost 100% methyl salicylate—the same therapeutic compound used in liniments to soothe muscle aches and painful joints—which may be why birch oil was a popular folk remedy for sore joints, sprains, and muscle aches caused by overexertion . All parts of this beautiful tree have been used by people living in temperate Europe and North America—as a textile material, medicine, perfume, and even a food! Several species of birch (genus Betula) can be found in temperate regions of the world; Betula alba is the species typically used to extract birch essential oil. Birches are small to medium-sized trees or shrubs with serrated leaves and characteristic smooth, shiny bark marked by horizontal oval strips called lenticels . 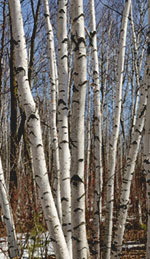 Birch bark can be white, yellow, silver, or black depending on the composition of essential oils in the bark tar; common names for different species of birch often use the color of the bark as a distinguishing characteristic. The name “birch” is thought to derive from an Indo-European root meaning “to shine”, in reference to birch bark’s beautiful sheen . The tough outer bark of the birch tree can be peeled off the trunk in papery sheets, and was used as a durable natural paper by people in continental Europe for hundreds if not thousands of years. In fact, the bark’s tar content makes it so resistant to decay that birch bark drawings dating from 1240-1260 CE have been recovered at archaeological sites near Novgorod, Russia ! Besides being a valued paper analogue, the bark of the birch tree has been used by humans in fragrancing, medicine, and even food—the soft inner bark of the birch tree is edible and was eaten as a starch in times when other starch sources were scarce . Interior birch bark may also have been used as the first “aspirin” in Europe and North America: the soft bark was steeped into a methyl salicylate-containing tea that was taken to treat headaches and congestion . In Russia, birch oil was a jealously guarded fragrance and key component in “Russian Leather”, a perfume so-named because it was once rubbed into book bindings to keep the leather soft, water-resistant, and pliable, as well as to repel insects that could cause damage . Ladies also scented their kerchiefs with a scent called Iceland Wintergreen that contained birch oil . Today, aromatherapists use birch oil in many of the same applications as wintergreen oil: as a topical liniment for sore muscles, joints, and sprains, and in diffusion to treat headache and sinus congestion . In Europe, birch essential oil is also one of the few essential oils approved to treat arthritis and other joint conditions in horses. Pure birch essential oil contains mostly methyl salicylate (the same active compound found in wintergreen oil), as well as creosol and guaiacol , which combined give pure birch oil an enchantingly fresh, minty scent! Aromatherapists also use a drop or two of birch oil in a warm bath to soothe sore muscles, promote circulation and encourage menstruation, especially when the latter has been delayed due to stress or emotional issues . Some people also find relief from the dry rough skin that accompanies eczema or psoriasis when birch oil is added to a lotion . A small amount of birch oil may also be added to a shampoo or conditioner to combat dandruff . Like wintergreen oil, birch oil is an oral toxin due to its high methyl salicylate content . Birch essential oil should never be taken internally or used over large areas of the skin . Birch oil is best used in diffusion from an oil burner or diffuser, or topically in extremely limited quantities. The oil’s refreshing, minty aroma blends exceptionally well with woody or floral oils such as jasmine, rose, benzoin, rosemary, and sandalwood. 1. Keville, Kathy. “Aromatherapy: Birch”. HowStuffWorks. Accessed September 12th, 2014. http://health.howstuffworks.com/wellness/natural-medicine/aromatherapy/aromatherapy-birch.htm. 2.“Birch”. Wikipedia. Last modified September 9th, 2014. http://en.wikipedia.org/wiki/Birch. 3. “Health Benefits of Birch Essential Oil”. Organic Facts. Accessed September 12th, 2014. https://www.organicfacts.net/health-benefits/essential-oils/health-benefits-of-birch-essential-oil.html. This entry was posted in Aromatherapy, Essential Oils and tagged arthritis, circulatory stimulant, dry skin, pain relief on October 15, 2014 by Keith Cleversley. Among the many resin-based essential oils is a little-known product called opoponax essential oil. Made from the gum resin of the sweet myrrh tree, Commiphora erythraea, opoponax is one ingredient in the famous Biblical ketoret incense blend, alongside labdanum, benzoin, and frankincense . Although opoponax oil is most famous these days as the essential base note to many famous fragrances such as Coco by Chanel, this musky, almost animalic scent is still used in magical practice today to open the mind to hidden secrets and inner knowledge. Opoponax can refer to several species of sweet gum-producing myrrh trees, including Commiphora guidotti, C. holtziana, C. pseudopaoli, and C. kataf, or African sweet myrrh . However, most of the opoponax resin and steam-distilled essential oil used in perfumes comes from Commiphora erythraea. The opoponax tree is an evergreen related to the “true” or “bitter” myrrh Commiphora myrrha . Like myrrh and frankincense, opoponax is found in the Mediterranean and North Africa, where it thrives in thin, rocky soil or scree and plentiful sunlight. Somalia is currently considered the biggest exporter of opoponax resin in the world . 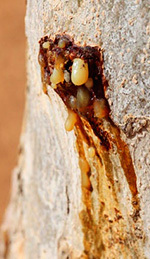 Opoponax resin is traditionally harvested by making slashes in the bark, causing the tree to exude a red or brown secretion. This resin is collected once it dries into hard nodules that can be steam distilled to produce an essential oil. These nodules of opoponax resin were also once burned as incense during Hebrew ceremonies, or mixed with other ingredients to create the ceremonial incense blend ketoret, as recorded in the Old Testament . Perhaps reflecting this tradition, modern perfumers use opoponax to add balsamic notes to Oriental or “chypre”-type fragrances. Opoponax resin has had some occasional use in herbal medicine, mostly as an antispasmodic, deobstruent, remedy for hysteria, and to sharpen the senses . People also used it as an emmenagogue, though there is little evidence to support this particular use today . Despite the fact that its cousin, myrrh oil, is highly antiseptic and also an effective analgesic for sore gums and painful joints , opoponax oil is not commonly used in aromatherapy and is mostly reserved for use in perfumery and incense making. 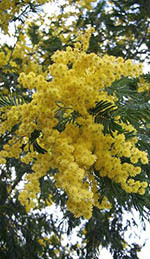 That said, opoponax essential oil is often considered a very spiritual oil: opoponax is used in divination and magical work to open the mind to occult knowledge, to learn what is hidden, and to effect change in the subconscious as the first step to making a conscious change in one’s personal or professional life . The oil is associated with the planet Pluto in astrology . You can diffuse opoponax essential oil from an oil diffuser or burner to encourage receptivity to spiritual forces, or wear some as perfume and absorb its centering vibrations all day long. Opoponax oil is generally non-sensitizing and non-irritating, but like all essential oils, it should be patch-tested before use and applied only in dilution . Oil of opoponax provides the base note or undertone to many famous perfumes, including Opium by Yves St Laurent, Coco by Chanel, and Shalimar by Guerlaine ; this resinous oil’s rich tones of black tea, incense and amber lovingly anchor lighter floral and citrus notes such as lavender, rose, bergamot, and lemon, and melt into richer scents such as vanilla and sandalwood for a truly “scentuous” experience! 1. Ali, Naheed Shoukat. “Opoponax. Lat. Commiphora erythraea”. Fragrantica. Accessed July 23rd, 2014. http://www.fragrantica.com/notes/Opoponax-37.html. 2. “Opopanax”. Wikipedia. Last modified July 21st, 2014. http://en.wikipedia.org/wiki/Opopanax. 3. Grieve, M. “A Modern Herbal | Opoponax”. Accessed July 23rd, 2014. https://www.botanical.com/botanical/mgmh/o/opopon10.html. 4. Roth, Harold A. “Opoponax Essential Oil” Alchemy Works. Accessed July 23rd, 2014. http://www.alchemy-works.com/essential_oils_opoponax.html. 5. “Opoponax: Velvet and Smoke Perfume Ingredient”. Bois de Jasmin: Perfume and Other Fragrant Pleasures. Last modified May 31st, 2012. http://boisdejasmin.com/2012/05/opoponax-velvet-and-smoke-perfume-ingredient.html. This entry was posted in Essential Oils on August 8, 2014 by Keith Cleversley. What the heck is lavandin oil anyway? A brand name, a catchy neologism, or a misspelling of lavender oil? None of the above! Lavandin is actually a real plant: it is a sterile cross between the world-famous true lavender (Lavandula angustifolia) and spike lavender (Lavandula latifolia) . As a sterile cultivar of lavender, lavandin is similar in appearance, but its essential oil composition is notably dissimilar; as a result it has different though equally important uses in aromatherapy. The Latin name for lavandin is Lavandula x intermedia; the ‘x’ represents that lavandin is a hybrid cross between two different species of lavender . Like true lavender, lavandin comes in a number of different cultivated varieties, but the most common varietal used in essential oil production is the “Grosso” strain, so named for its large, prominent flower spikes. In general, lavandin can be distinguished visually from lavender by its taller height and its larger, longer flower spikes. Additional flower clusters also grow laterally up the stems of lavandin plants. Lavandin flowers can be either bluish purple (similar to lavender flowers) or purplish gray like spike lavender flowers. Because lavandin is sometimes found growing near lavender or spike lavender plants, botanists believe it may have come into being as a natural hybrid created by cross-pollination between L. angustifolia and L. latifolia in the wild . Hybrid lavandin plants were first cultivated in 19th-century France for use in the essential oil industry. It quickly became an important oil in perfumery, and has been included in famous perfume blends up through the present era, including possibly the most famous commercial fragrance of them all, Chanel No. 5. In fact, Pierre Wertheimer, a perfumer known as the “perfume king” who worked closely with Chanel in creating this fragrance, even named his prize racehorse Lavandin! His dame was named Lavande, the French word for true lavender . Lavandin is markedly different in the essential oil it produces: lavandin essential oil contains about 7% camphor, the same cooling compound found in the essential oil of the camphor tree Cinnamomum camphora . This ratio of camphor is much higher than that in true lavender oil, giving lavandin oil a muskier, more penetrating aroma than the delicate floral scent of lavender. Lavandin is actually preferred in commercial cultivation of oils used for soaps, detergents and fragrances because it grows faster, produces a higher oil yield per pound, and is hardier than lavender: while lavender does best in higher altitude, Mediterranean climates, lavandin can thrive in a variety of altitudes and climatic conditions. 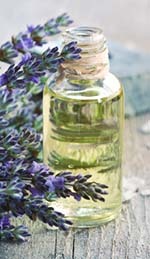 Many people perceive lavandin oil as being lower quality simply because it is cheaper to produce in volume than lavender oil, but this is a misconception. Although lavandin oil is popularly used in detergents, soaps, and other “industrial” fragrancing applications, due to its high camphor content, therapeutic-grade lavandin essential oil can also be used in aromatherapy, especially for inflammatory conditions . Aromatherapists use lavandin oil in diffusion to clear nasal and respiratory congestion, clear sinuses, and as a mosquito repellent that may be more effective than lavender oil . Once diluted in a carrier oil, lavandin essential oil also acts as an anti-inflammatory for sore muscles and joints: its camphor content produces a direct cooling effect on tissues and stimulates circulation to flush away inflammatory free radicals . Lavandin oil is also known to be both calming and somewhat stimulating to the mental faculties. The oil is sometimes used to reduce nausea while bolstering the appetite and energy levels throughout the body . However, unlike lavender oil which is therapeutic for burns, lavandin oil should never be used to treat burns or irritated skin, because the camphor content in lavandin oil can actually irritate burned tissue . When it comes to fragrancing, lavandin is simple: even though it has a muskier, more camphoraceous scent compared to lavender, the oil blends well with many of the same oils as lavender does, including clove, rosemary, thyme, sage, and citrus oils (especially bergamot and lime) . Lavandin’s bolder aromatic presence can sometimes put people off this essential oil in favor of lavender, but this hybrid variety of lavender has a lot to offer in aromatherapy! 1. “Lavender vs. Lavandin”. Jersey Lavender. Last modified November 27th, 2010. http://blog.jerseylavender.co.uk/?p=260. 2. “Lavandin (horse)”. Wikipedia. Last modified May 10th, 2014. http://en.wikipedia.org/wiki/Lavandin_(horse). 3. Svec, Susan. “What the Heck is Lavandin?” Susan’s Natural Soap Blog. Last modified August 17th, 2009. http://susansoaps.com/blog/what-the-heck-is-lavandin/. 4. “Lavandin Oil Benefits”. Yogawiz. Accessed July 16th, 2014. http://www.yogawiz.com/aromatherapy/aromatherapy-essential-oils/lavandin-oil.html. This entry was posted in Aromatherapy, Essential Oils and tagged antidepressant essential oil, pain relief essential oil on July 24, 2014 by Keith Cleversley. 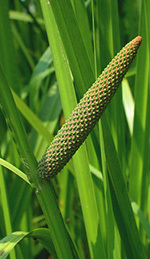 The plant Acorus calamus has been known by many complimentary names throughout history, including “sweet flag”, “sweet cane”, “sweet grass”, “sweet cinnamon”, and “myrtle grass”. As the name suggests, calamus root has been a valued ingredient in perfumery and cooking for centuries—especially in medieval Europe and Asia, where it was often used a substitute for cinnamon, ginger, and nutmeg due to the sweet, cinnamon-like scent of its roots . Calamus essential oil has likely been used even longer as a perfume ingredient, and it’s still prescribed in American herbalism for stomach conditions such as gastritis, to calm nerves, and to relieve fatigue . Acorus calamus is a perennial marsh plant with upright, flat green leaves. It grows in wetland areas and the margins of lakes, ponds and rivers, though it can tolerate drier soil if the shoreline recedes. Calamus also has a yellow cone-like flowering body reminiscent of a pine cone, and strongly scented roots that are harvested to distill the essential oil . Although calamus isn’t a remarkable plant visually, it is notable for coming in three genetic variants with different numbers of chromosomes . The native North American variety, Acorus calamus var. americanus, is diploid, meaning it has two sets of chromosomes, while the Asian variety Acorus calamus var. angustatus is tetraploid, with four sets of chromosomes. An infertile triploid form, Acorus calamus var. calamus, is thought to have been created somewhere in the Himalayas by crossing the diploid and tetraploid calamus varieties. This infertile variety is now the most common calamus in Asia due to propagation by humans . A mention of calamus essential oil as a perfume ingredient appears in the Chester Beatty Egyptian Papyrus IV dating from 1300 BC . Calamus root also appears in the Old Testament (Exodus 30: 23-25) as an ingredient in holy anointing oil, in which it was steeped in olive oil along with cinnamon, cassia bark, and myrrh . More recently, calamus roots were used as a strewing herb in the Middle Ages along with lavender in the belief their scent repelled fleas . In Asia, calamus root was prized as a digestive tonic and was processed into several edible forms: calamus roots could be steeped in water to make a tea or decoction, boiled to make simple syrups and calamus candy, or simply chewed after meals . Calamus root from Acorus calamus var. americanus had somewhat different uses among indigenous Native Americans. In North America, the whole calamus root was typically either chewed or held in the mouth beside the cheek. Calamus root was used to prevent or alleviate fatigue during long journeys, to calm the mind while removing fears and anxieties, and to improve focus during long sweat lodge ceremonies. Calamus was also taken as a lozenge to soothe a sore throat caused by the prolonged singing often involved in these ceremonies . Today, calamus root and calamus essential oil appear in American herbalism as remedies for GI disorders such as upset stomach, flatulence, constipation, loss of appetite, ulcers, and gastritis . The inhalation of calamus oil was also recommended in Ayurveda to relieve nasal congestion and as a prophylactic against the common cold . However, while whole calamus root is edible, calamus essential oil can cause seizures and delirium if ingested and should never be taken internally. Pregnant or nursing women should also avoid calamus oil. Finally, calamus oil should always be used sparingly in dilution . Emotionally, calamus oil has both stimulant and relaxant properties when its sweet-spicy aroma is inhaled; it can be used to calm anxious mental states and panic attacks, and is especially reputed for calming the physical symptoms associated with anxiety, such as dizziness and a queasy stomach . Herbalists think calamus may work this way by acting as a mild muscle relaxant . With its uplifting and warm scent, calamus essential oil is often used in Angel magic, white magic, and as a Sun scent in blends with cedarwood, frankincense, cinnamon, lime, orange, patchouli, and sandalwood. 1. “Calamus”. WebMD. Accessed June 20th, 2014. http://www.webmd.com/vitamins-supplements/ingredientmono-778-CALAMUS.aspx?activeIngredientId=778&activeIngredientName=CALAMUS&source=0. 2. MacDonald, Jim. “Sweet Flag/Bitter Root; Acorus calamus var. americanus”. Herbcraft. Accessed June 20th, 2014. http://www.herbcraft.org/calamus.html. 3. “Acorus calamus”. Wikipedia. Last modified June 19th, 2014. http://en.wikipedia.org/wiki/Acorus_calamus. 4. Roth, Harold A. “Calamus Root Essential Oil”. Alchemy Works. Accessed June 20th, 2014. http://www.alchemy-works.com/essential_oils_calamus.html. This entry was posted in Essential Oils on July 8, 2014 by Keith Cleversley. Among the many essential oils derived from tree resins, there is a little-known product known variously as benzoin essential oil, styrax oil, or storax oil. You may have heard these terms in different places, but they all refer to the same botanical product. Benzoin essential oil is steam distilled from a resinous exudation produced by trees in the Styrax genus, and is used to make incense, food flavorings, and perfume fixatives. The genus Styrax contains several species of trees, both deciduous and evergreen, that are native to warm and tropical regions of the Northern Hemisphere; most Styrax species are found in Southeast Asia, but some occur in South America as well . With so many different species of Styrax trees out there, it’s more important than ever to know which varieties produce a useful essential oil, so you can arm yourself with that knowledge when it comes time to make a purchase. The two species in the Styrax genus from which an essential oil is produced commercially are Styrax tonkinensis (found in peninsular Southeast Asia–Laos, Cambodia, Thailand and Vietnam) and Styrax benzoin (from Sumatra) . This article will use the term “benzoin” interchangeably to refer to both varieties. The resin of S. tonkinensis—also called “Siam” benzoin—is reddish yellow on the outside with a milky white interior; it contains up to 40% benzoic acid, along with benzoresinol, siaresinotannol, and vanillin, giving it a lighter, more vanilla-like scent. It is much more frequently used in perfumery and food flavoring than the “Sumatra” variety S. benzoin, which produces a reddish gray resin with a sharper, more balsamic scent due to a higher content of cinnamic acid . However, both forms of benzoin essential oil have valuable fixative properties in perfumery, as well as expectorant, emollient, and calming properties when used in aromatherapy . The Arabic name for benzoin is luban jawi, or literally, “frankincense from Java”; this ancient name points to the role of benzoin resin and oil in the ancient world as an incense ingredient and medicine that was equated with frankincense oil. Official records of the international trade in benzoin date from the Middle Ages, but the linguistic and archaeological evidence suggests benzoin was important in the Western world far earlier than that. The Phoenicians were importing the resin of a Styrax (probably Styrax officinalis) into Greece from the Ancient Near East before the common era, and benzoin resin has been one candidate proposed for nataf, a component of the sacred Hebrew incense recorded in the Old Testament . Later on, the Orthodox Christian Church burned benzoin resin as incense along with other rich middle notes such as opoponax and labdanum; various Styraxes also show up in Heberew rituals and in the Muslim world. One interesting use of benzoin was actually as a “snake repellent”: farmers in the Middle East burned bowls of benzoin during the frankincense harvest to drive away snakes that were believed to guard the trees ! Medicinal uses for benzoin included as a skin antiseptic and mild emollient for irritated skin, an expectorant agent, and an analgesic for sore joints . Though usually benzoin resin was dissolved into a tincture to treat these conditions, the essential oil could also be inhaled, especially to treat bronchitis and other lower respiratory infections. The Muslim physician Avicenna (Ibn Sina) even recommended a combination of benzoin resin with other antiseptic oils as a dental amalgam to replace lost or damaged teeth ! Today, aromatherapists will sometimes use benzoin essential oil in dilution to treat sore joints, chapped or dry skin, coughs, bronchitis, and stress-related conditions . Benzoin has a rich grounding scent that is calming to the psyche, making it useful for alleviating anxious states of mind induced by stress; it is traditionally associated with opening the root chakra in Buddhist meditation practices . Benzoin oil should always be diffused or used in dilution for topical applications, to avoid possible skin sensitization. Blending best with resinous, woody and citrus oils, benzoin oil yields an intriguing aroma that may be suitable for meditation when mixed with frankincense, myrrh, cedarwood, sandalwood, patchouli, and vetiver . For a brighter, more uplifting scent with pleasant “orange” notes, combine benzoin oil with citruses such as bergamot, mandarin, tangerine, or sweet orange oil! 1. “Benzoin Resin”. Wikipedia. Accessed May 20th, 2014. http://en.wikipedia.org/wiki/Benzoin_resin. 2. Grieve, M. “A Modern Herbal | Benzoin”. Accessed May 20th, 2014. http://www.botanical.com/botanical/mgmh/b/benzoi31.html. 3. “Styrax”. Wikipedia. Accessed May 21st, 2014. http://en.wikipedia.org/wiki/Styrax. 4. Lawless, Julia. 2013. The Encyclopedia of Essential Oils: The Complete Guide to the Use of Aromatic Oils in Aromatherapy, Herbalism, Health, and Well-Being. Conari Press. 5. “Styrax Benzoin Resin/Styrax Benzoin Absolute”. AromaWeb. Accessed May 22nd, 2014. http://www.aromaweb.com/essential-oils/benzoin-absolute.asp. This entry was posted in Aromatherapy, Essential Oils and tagged pain relief essential oil on June 30, 2014 by Keith Cleversley. Oakmoss essential oil is one of those perfume ingredients you see listed in so many articles on aromatherapy as well as ingredient lists; yet it is not often that readers get a clear definition of what oakmoss is. As the name suggests, oakmoss is commonly found on or near the trunks of mature oaks; however, it is not a moss but actually a lichen that grows on both deciduous and coniferous trees. Oakmoss essential oil has been distilled for use in perfumery since at least the 16th century, and its woody, almost animalic scent is still much valued as a base note in commercial fragrances . The specific kind of lichen that yields genuine oakmoss essential oil is Evernia prunastri, a species native to the mountainous forests of the Northern Hemisphere, especially central and western Europe . 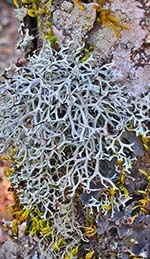 Growing on the trunks or branches of mature oaks and other trees, oakmoss lichen has strap-like branches called thalli that resemble deer antlers in shape. Oakmoss thalli are greenish gray and tough when dry, and turn a rubbery olive green when wet. Oakmoss essential oil is used extensively in perfumery today for its complex scent, which has been described as woody, sweet, and sharp. The aroma of oakmoss oil varies depending on whether it is distilled as an essential oil or a more concentrated absolute oil; the essential oil is generally considered to have a lighter scent, while the richer absolute oil possesses a muskier scent with an almost leathery undertone . Oakmoss oil’s complex array of odors can even be affected by what type of tree the lichen is growing on: some oakmosses that grow on coniferous trees are specially sought for their turpentine-like base tones, which add a refreshing sharpness to specific perfumery blends. Though not as historically famous an essence as labdanum, frankincense, or myrrh, archaeological evidence suggests that oakmoss oil was known in the ancient Mediterranean world: baskets full of dried oakmoss lichen have been discovered in Egyptian tombs, though it is unclear whether the lichen was being stored to make fragrances or as food . A competing theory suggests that oakmoss, which contains a starchy edible substance inside its thalli, was being stored as a potential emergency food supply. In North America, Native Americans called oakmoss lung wort or lung moss. Various tribes frequently dried the lichen and used it as a folk treatment for respiratory ailments such as respiratory congestion, irritation, chest cough, and even bronchitis . The dried lichen was also used as a poultice to speed wound healing . Though neither of these medicinal uses have yet been investigated for their effectiveness in a clinical setting, oakmoss’s traditional association with respiratory health does suggest some fascinating avenues for future research! For the time being, it seems that oakmoss will continue to be sought after as a fixative, fragrance, and exotic perfume ingredient, especially in Oriental and “chypre”-type blends . The traditional base note of fougère perfume, oakmoss essential oil is also commonly used as a fixative in blends and soaps, since its rich scent helps anchor more fleeting notes, especially citruses. In recent years, international regulations have limited the allowed amount of oakmoss oil in perfume blends to 0.1% after evidence came to light that it can be a dermal irritant in larger quantities . So, when making your own blends it is also best to blend a minute quantity of oakmoss essential or absolute oil with other essential oils in a neutral base such as almond, jojoba or olive oil. Adding oakmoss oil to your blend will also allow you to take advantage of the oil’s prized fixative qualities! As mentioned above, oakmoss oil is stellar at anchoring more delicate scents in a fragrance blend and helping them last even longer. Ideal for bringing out tender floral and citrus notes such as lavender, neroli, and bergamot, oakmoss essential oil provides a comforting base note that can add dimension and intrigue to any fragrance. 1. “Oak Moss”. Encyclopaedia Britannica Online. Accessed June 18th, 2014. http://www.britannica.com/EBchecked/topic/423437/oak-moss. 2. “Evernia prunastri”. Wikipedia. Last modified June 6th, 2014. http://en.wikipedia.org/wiki/Evernia_prunastri. 3. Milojevic, Marina. “Oakmoss Perfume Ingredient”. Fragrantica. Accessed June 18th, 2014. http://www.fragrantica.com/notes/Oakmoss-39.html. 4. “Base Note Oils – Oakmoss Oil”. Accessed June 18th, 2014. http://ladylisa.usting.com/Base_Note_Oil_s/base_note_oil_s.html#Oakmoss. This entry was posted in Essential Oils on June 20, 2014 by Keith Cleversley. In recent years many essential oil suppliers have been offering a product called amber oil or amber essence. 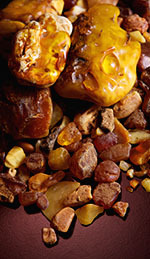 Amber oil is described as having a unique sweet-woody fragrance that can enhance a broad range of essential oil blends. In actuality, the many products out there called amber oil are a clever bit of marketing: unlike true essential oils that are steam distilled or otherwise extracted from a single plant, amber oil is a blend of several essential oils—often vanilla, labdanum, patchouli, benzoin, and other earthy, sweet oils—meant to simulate the scent of amber . So what is true amber and why can’t it be made into an essential oil? 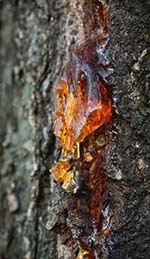 True amber is the fossilized sap or resin of trees, often pines and other evergreen trees. It can range in age from 200 years to millions of years; the oldest fossilized prehistoric amber has been dated to 345 million years ago! Most prehistoric amber is between 30 and 90 million years old . There is no one tree species responsible for producing amber: indeed, different regions of the world have different types of amber depending on the tree species that once lived there. Famous kinds of amber valued in jewelry making are Mexican amber—the transparent golden variety most people think of when they think of amber—and Baltic amber, an opaque, pale yellow variety. Yet amber comes in many more colors than these, including reddish brown, white, black, orange, red, green, and even blue. Amber appears throughout history primarily as decoration: with its myriad of colors, durability, and smooth pleasing texture, amber was sought after by the Romans, who carved it into jewelry, dice, and amulets. Emperor Nero even sent an expedition to Scandinavia to obtain this northern “gold”, thus establishing a trade route into northern Europe. Centuries later, Russian Tsar Peter the Great was given 6 tons of amber carved into ornate wall panels, a gift from Prussia (now Germany). In 1755, Tsarina Elizabeth had them installed, backed by gold leaf and mirrors, into a room of the royal palace that became known as the Amber Room. This 8th wonder of the world was destroyed during World War II but later reconstructed by the Smithsonian in 2003 , and you can go see this reconstruction today. Amber also has a more malleable intermediate form called copal, a semi-fossilized resin that hasn’t had time to harden into amber . It can be distinguished from amber by its lighter color—often white or citrine—and because it readily dissolves when a drop of acetone or chloroform is applied. Mesoamerican peoples such as the Maya and the Mexica (Aztec) burned copal as a resin incense, a practice that is still carried on by indigenous groups today. A form of East African copal from the amber tree (Hymenaea verrucosa) also came into demand in Europe and America during the 1800s as a wood varnish for carriages, train cars, and paintings . As you can see, amber has a variety of uses, from the ornamental to the practical. However, it is rarely used in perfumery because the fossilized resin’s woody scent is quite faint. It is best appreciated when worn as jewelry close to the face of the wearer, and would be quickly overwhelmed by being blended with stronger essential oils. However, if you still want to experience a scent that comes close to true amber, you can always blend together warm, woody, and earthy scents such as labdanum, patchouli, vanilla, benzoin, and more to recreate the calming, grounding aroma of this prehistoric essence. 1. Gottschalk, Adam. “What Is Amber Anyway? Raw Materials”. Fragrantica. Accessed April 22nd, 2014. http://www.fragrantica.com/news/What-is-amber-anyway–1704.html. 2. Shoukat Ali, Naheed. “Amber Perfume Ingredient.” Fragrantica. Accessed April 20th, 2014. http://www.fragrantica.com/notes/Amber-54.html. 3. “Copal”. Wikipedia. Accessed April 20th, 2014. http://en.wikipedia.org/wiki/Copal. 4. “Hymenaea verrucosa | Gum Copal”. Mpingo Conservation and Development Initiative. Accessed May 20th, 2014. http://www.mpingoconservation.org/mpingo-its-habitats/other-tree-species/non-timber-species/hymenaea-verrucosa-gum-copal/. This entry was posted in Essential Oils, Purchasing Essential Oils on May 29, 2014 by Keith Cleversley. Few historical “vices” have persisted in contemporary legend as has absinthe, the alcoholic drink made from the leaves of the wormwood plant. However, those of you excited to try absinthe, now that it has once again been made legal in the U.S., may be disappointed to learn that the legends of the green “muse” of Parisian artists and writers may be more interesting than the facts; most likely, the effects attributed to the wormwood in 19th-century absinthe were actually a result of good old alcohol intoxication. However, that doesn’t mean wormwood is without its uses: the herbage of wormwood has demonstrated benefits as a gastric stimulant, stomachic, tonic for indigestion, and remedy for intestinal parasites . Wormwood essential oil may also be used in minute quantities as a perfumery agent to give fragrances a unique licoricey undertone. There are several plants in the genus Artemisia of which wormwood is a member, including Artemisia abrotanum (southernwood), A. dracunculus (tarragon), A. vulgaris (mugwort), and A. annua (sweet annie) . It’s very important when purchasing essential oils to pay attention to the genus-species of the plant, because all these Artemisia species have very different chemical profiles and uses in aromatherapy and herbal medicine. 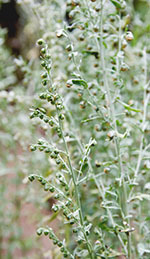 Wormwood is Artemisia absinthium, a perennial herbaceous plant with silvery green feathery leaves. It is native to temperate Eurasia and North Africa . In Europe and Asia, the bitter leaves of wormwood were commonly brewed into a tea and taken to treat intestinal parasites, relieve indigestion, and stimulate gastric juices [1, 3]. In fact, the name wormwood–from the Middle English “wormwode”–is a direct reference to the use of wormwood to kill intestinal parasites (worms) . The leaves were sometimes added to beer as a flavoring agent, along with mugwort and English ivy, before Bavarian purity laws restricted beer ingredients to hops, barley, sugar and water. The practice of adding wormwood to beer may have been the original inspiration for absinthe, an alcoholic drink flavored with wormwood and other herbal additives that skyrocketed in popularity among the artistic set of Continental Europe in the mid-1800s . A classic glass of absinthe, with slotted spoon and sugar cube. 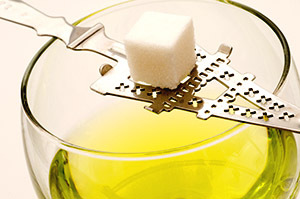 Traditionally, water is drizzled through the sugar cube to sweeten the drink. During its heyday, absinthe was considered the drink of choice for artists, writers and other bohemian creative types in Europe, especially Paris, and its inspirational properties were praised by the likes of Vincent Van Gogh, Oscar Wilde, and Edgar Allen Poe . However, absinthe experienced a dramatic reversal in the early 1900s when it was implicated in a disorder called absinthism, which led to the drink being banned for the next seventy years. Physicians of the time described absinthism as a condition characterized by seizures, debility, mental illness, hallucinations, and violent behavior, and they blamed the wormwood in absinthe as the cause . Wormwood was probably implicated in absinthism because it contains thujone, a compound which can be neurotoxic in large doses . However, the levels of thujone in absinthe are not enough to cause harm . Most researchers today believe that what 19th-century doctors called absinthism was likely a result of alcohol abuse, a condition poorly understood at that time . Another explanation is that some inferior brands of absinthe were dyed bright green using toxic compounds such as copper sulfate or antimony chloride, which caused brain damage in those unfortunate enough to consume these inferior brands . When buying absinthe even today, it’s important to only buy brands that have not been artificially dyed green, blue or another color. High-quality absinthe is naturally green due to the presence of chlorophyll . Wormwood essential oil is not absinthe and should never be taken internally, as it is an oral toxin that can induce kidney failure and seizures due to its high thujone content . For this reason, wormwood oil is not used in aromatherapy. It may be used in minute quantities as part of an exotic perfume blend along with other licorice-like or floral essential oils such as anise, lavender, oakmoss and neroli. Interestingly, a recent double-blind placebo-controlled study examined the potential of a herbal wormwood preparation made from the fresh leaves to relieve the symptoms of Crohn’s Disease . Both groups of subjects had their Crohn’s Disease under control through standard steroid therapy before the study. During the trial, the steroid therapies were reduced and the experimental group was given a preparation of wormwood while the control group received no additional treatment. The control group experienced the expected worsening of symptoms, while the wormwood-treated group actually had an improvement in their symptoms, apparently due to the wormwood . Though the researchers cautioned that more studies are needed, we thought this little tidbit about wormwood’s potential for treating Crohn’s Disease was worth sharing with all of you! 1. “Artemisia absinthium”. Wikipedia. Accessed May 5th, 2014. http://en.wikipedia.org/wiki/Artemisia_absinthium. 2. “Artemisia (Genus)”. Wikipedia. Accessed May 5th, 2014. http://en.wikipedia.org/wiki/Artemisia_(genus). 3. Grieve, M. “A Modern Herbal: Wormwoods.” Botanical.com. Accessed May 5th, 2014. https://www.botanical.com/botanical/mgmh/w/wormwo37.html. 4. “Wormwood | Artemisia absinthium | Common Wormwood”. NYU Langone Medical Center. Last modified August 2013. http://www.med.nyu.edu/content?ChunkIID=111819. 5. Lux, Erowid F. November 2007. “The Absinthe Engima: Resurgence of a Legendary Spirit.” Erowid Extracts 13: 12-14. This entry was posted in Essential Oils on May 8, 2014 by Keith Cleversley.